(Phys.org) —Growth is a ubiquitous phenomenon in plants and animals. But it also occurs naturally in chemicals, metals and other inorganic materials. That fact has, for decades, posed a major challenge for scientists and engineers, because controlling the growth within materials is critical for creating products with uniform physical properties so that they can be used as components of machinery and electronic devices. The challenge has been particularly vexing when the materials' molecular building blocks grow rapidly or are processed under harsh conditions such as high temperatures. Now, a team led by researchers from the UCLA Henry Samueli School of Engineering and Applied Science has developed a new process to control molecular growth within the "building block" components of inorganic materials. The method, which uses nanoparticles to organize the components during a critical phase of the manufacturing process, could lead to innovative new materials, such as self-lubricating bearings for engines, and it could make it feasible for them to be mass-produced. Xiaochun Li, UCLA's Raytheon Chair in Manufacturing Engineering and the principal investigator on the research, compared the new process to creating the best conditions for plants to grow in a garden. "In nature, some seeds sprout earlier than others and the plants grow larger, preventing nearby sprouts from growing by blocking their access to nutrients or sunshine," said Li, who also is a professor of mechanical and aerospace engineering. "But if the earlier plants are on a controlled diet that limits their growth, the other plants will have a better chance to be healthy—maximizing the yield in the garden. "We are doing this on a nanoscale, controlling growth at the atomic level by physically blocking agents of growth to obtain high-performance materials with uniformity and other desired properties. It is like an atomic diet control for material synthesis." The method uses self-assembling nanoparticles that rapidly and effectively control the materials' building blocks as they form during the cooling—or growth—stage of the manufacturing process. The nanoparticles are made of thermodynamically stable materials (such as ceramic titanium carbonitride) and are added and dispersed using an ultrasonic dispersion method. 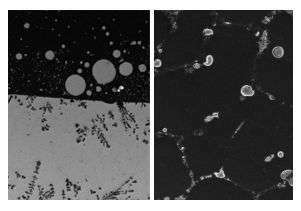 The nanoparticles spontaneously assemble as a thin coating, significantly blocking diffusion of the materials. "We are controlling the nucleation and growth during the solidification process in order to obtain uniform and fine-size microstructures," said Lianyi Chen, the lead author of the study and a postdoctoral scholar in mechanical and aerospace engineering. "With incorporation of nanoparticles, the aluminum-bismuth alloy exhibits 10 times better performance in terms of reducing friction, which can be used to make engines with significantly improved energy efficiency." Other contributors to the research include Jiaquan Xu, a UCLA engineering graduate student; Hongseok Choi and Hiromi Konishi, former postdoctoral scholars advised by Li while he was on the faculty of the University of Wisconsin – Madison; and Song Jin, a professor of chemistry at Wisconsin.